I just updated Ubuntu 8.04. Server not using user level security and no password supplied. I can confirm this problem on hardy. It may be caused by me not getting a username/password dialog when connecting to smb://server. When not using kerberos I see no shares (could be because I only allow users to view shares *after* authentication) and samba server-side has "restrict anonymous" set to "1". Which means that listing the shares requires a logon. I can only view the shares if I create a kerberos ticket. After that I can see the shares, but when I click on one, I get the above mentioned error. After that gnomevfs-ls smb://server/share also works. After that gnome-vfs-ls smb://server/share also works. It would appear that nautilus smb support is broken in hardy somehow, at least for authenticated smb support. Note that this used to work in feisty and gutsy. Just seen that this problem occurs because of the switch to gvfs in nautilus. gvfs-ls smb://server shows absolutely nothing. Even after mounting smb://server or smb://username@server. Same for gvfs-ls smb://username@server. Browsing doesn't work in nautilus at all. Even when using kerberos mounting smb://server/share doesn't work. Only smb://username@server/share works. After this is mounted gvfs-ls smb://username@server/share shows the proper directories. However in nautilus this doesn't work. Browsing from "computer:" using the "share on server.mount" doesn't work with nautilus. Could be because the username isn't supplied in the mount file. gvfs-mount -l shows "Mount(0): share on server -> smb://server/share" instead of smb://username@server/share. Not that I think username@ should be needed in this case, it's just plain stupid IMHO. 2/ I still can use smbmount command to mount the Windows shares and then browse the folders/files using nautilus. Works fine. 3/ Not all Windows share give me the same problem. I have shares served by a Windows 2003 server and it works but shares served by the file server box (DLink DGM-660) are having problem. Even though they all work fine under 7.10. I confirm this problem exactly to user Wilco Baan Hofman. Nautilus stopped to work after the 8.04-alfa-3 release. If I mount the shareres folders in the shell, nautilus work fine. No problem to works on Debian unstable (sid) and Gutsy. My shares served is debian 4.0r1 stable version. I confirm the exact same problem. Used to work in 7.10, just upgraded to test 8.04 and unable to mount windows share. It seems a quite important problem for users who are running ubuntu at work when the network is a windows one. I can browse WIndows Share, but hen i try my server running ubuntu 7.1 I can see all the share foldes but cant mount them. I confirm this problem with Nautilus 2.22.2-0ubuntu3. My debian server runs with "security = share". All public directories work fine but the shared home directories which require authentication don't work anymore with nautilus in ubuntu hardy. Windows XP has no problems with these shares. I can verify that this is also happening for me. It used to work in the previous version but not for Hardy. This needs to be sorted out before the release in 5 days, or with an update asap. several issue seem to be described there which make the work harder now. connecting to an user directory on a ubuntu samba server using security share works correctly once smbpasswd has been used to define the samba password for the corresponding user, not confirming the issue. could you describe exactly how you configure your server and what steps you use in GNOME? Did you try to use "gvfs-mount smb://smbname/share"? Do you have anything in the server logs? Does smbclient works correctly? Sebastien, I have some of the info you requested in your post above in duplicate bug #215570. Prior to Hardy, I could browse my corporate Active Directory SMB shares using Nautilus. I was prompted for my login and password if I hadn't previously accessed a share, saved it to my keyring, and from that point on had no problem accessing any share I needed to (and had permissions for). I could simply browse any server similar to "Network Neighborhood" in Windoze. After upgrading to Hardy, that is no longer the case. I can see the servers, but as soon as I try to open one- I get an empty container and my AD account gets locked out. Apparently Nautilus is trying to access the shares with a bad or no password. It does still seem to be using my login name (since I'm getting locked out of the AD network). If it matters- my Ubuntu login password is different from my AD login. Note too: While the problem with Microsoft AD is the biggest one I see, I have the same problem on my small home network that uses SMB on a LInux server. I can no longer browse shares on it either. No application is registered as handling this file. It is necessary on a manual mount to actually specify the share name. I can't just mount a server to have easy access to all shares on it, like I used to in Gutsy (and Feisty, and I believe Edgy). Even with the error- the share shows up on my desktop (and in Places) and I can access it for a time. It seems to timeout after about a half-hour of inactivity though, and then I have to manually mount it again (something else that wasn't happening before). For example- if I open a spreadsheet on a share, and spend a half hour or so editing it, when I try to save it- I have to enter my username and password again. I think the problem is Nautilus or gvfs doesn't seem to be prompting for user credentials if it cannot access a share like it used to. It also doesn't seem to be caching them very well anymore when it does (through a manual mount). I tried deleting my gnome keyring, so it shouldn't be using a saved password anymore (and even if it was- it should be working since I haven't changed it). I don't know if any of this helps, but that's my experience. I'll gladly provide any information I can if it helps get this fixed. This is a big deal for anyone using or trying to use Ubuntu in a corporate environment, most of which run Microsoft AD. This problem only seems to apply to authenticated SMB shares. Shares that do not require authentication work fine. There is nothing in the dmesg. I have checked and the user name and passwird are correct. I use the smbmount command fine with this name and password. Being that 8.04 is 3 days away from final release, will this issue be addressed by then? Is there a work-around I can find for this issue? I'm having a similar problem in that all my 7.10 systems can connect fine utilizing Places -> Connect to Server -> Windows Share but all the 8.04 systems get the aforementioned error message. I have a password protected Samba (Debian Sid) share perfectly working with Windows hosts and Ubuntu Gutsy. I see the "homes on server" icon on the desktop BUT clicking on it simply gives me the usual "Unable to mount location" error. I can unmount it from the desktop though. I just realized that smb://server/blues/ works from Nautlius as expected. The problem is with the special share smb://server/homes/ only! This bug is a deal-breaker for me. I do not plan to upgrade to Hardy until this is fixed. With every release since 5.10 I've had various troubles with Nautilus browsing and/or mounting samba network shares. I've found workarounds in the past, but I was hoping this stuff would all be coming together a little better by now. I can post my smb.conf file if that would help anyone to debug this. I can access my shares with 6.10, but not with 8.04. - when you share an user directory, did you use smbpasswd to set a password for the corresponding user? - can you access to the '/' directory on the server? - do you use a directory which has different rights for anonymous and authentificated users? - can you browse the share using an another os or ubuntu version? - what server do you try to use? - does smbclient on hardy success to connect? I have a setup with LDAP, but same thing really. security = user. restrict anonymous = 1, share only visible and accessible for authenticated users. If you mean smb://server/ then no, but that's the browsing issue. Yes. Not visible for anonymous (like homes) and also not able to connect to as anonymous user. - does smbclient on hardy succeed to connect? gvfs-mount smb://server/homes doesn't work. likely because valid users = %S is active, which means that this is as it was intended. gvfs-mount smb://server/username works for me. * gvfs-mount smb://server/share doesn't work, likely because an anonymous bind on this share results in the share not found error, instead of authentication failed, because the anonymous user can't see this share. * Anonymous bind should only be used as fallback. * username@ should not be needed, because it should ask for the username and password, and current username should be default. I am also having this problem. Clean installation of Hardy shows no shares available on a Windows file server. Used to work fine with this particular file server under Gutsy. I can also confirm this problem. On Gusty could see shares on Windows file server, after upgrade to hardy can no longer see any shares. If I explicitly browse in nautilus (e.g. 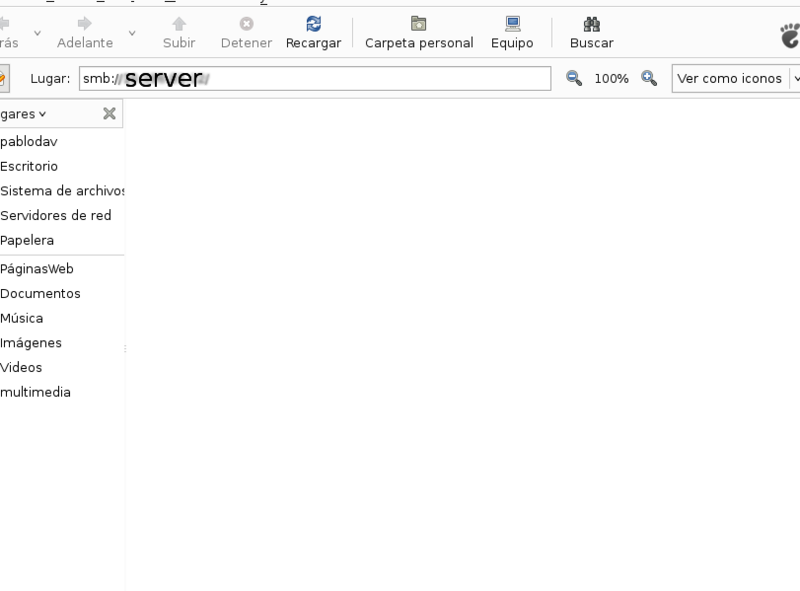 smb://servername/ ) I get to see all the shares on the server but smb:/// shows no machines. Permanent mounts in fstab also fail to work. If I browse onto the share using Nautilus via smb://servername/ then the share is automatically mounted. I am having a similar problem with Vista and XP. Ubuntu can see the Windows computers but when I click on them it fails to read the shared directories. Ubuntu shares with windows just fine. I can access all my Ubuntu shares on my Windows machines. Also, when I try and launch Samba, it crashes. I suspect that it has something to do with it. It works fine on konqueror and some smb apps like smb4k. PS: my samba server also crashes. If you attempt to connect to an authenticated SMB share, you get a blank window in Nautilus. If you append to the server name string, one of the available shared directories, you're asked if you want to allow access to the keyring. If you allow access, the directory mounts! Contents of the specified shared directory appear, and it is shown as mounted in the "Tree" pane on the left. I had Gutsy, did and in place upgrade to Hardy and the problems started, I was unable to mount SMB shares from either trues Windows or Samba presented shares from a Gusty server. If I simply enter a SMB server that is presenting shares, ie try to get a list of available shares, I get the error messges. The only options I found worked were similar to the poster above. Ensure you enter the correct servername/IP. Ensure you enter the SMB share name. Ensure you enter a username ( my internal network has no passwords for SMB shares, just usernames ). It the comes up with the keyring dialogs and then presents the failure to mount shares on server X error dialog, but then brings up a nautilus window with the folders that are on the share! All seems very "up-in-the-air", but it usable the only niggle is you have to know the name of the shares, which means keeping a list to hand or going around back on SSH connection and listing the smb.conf. As said earlier- you can mount a share if you use "Places => Connect to server" and then use an actual share name. There is no way to browse shares through Nautilus. This is a real pain if you have a large network with lots of servers and shares. The specified location is not mounted. However- the location is in-fact mounted, and shows up in the Places menu afterwards. It also creates a desktop shortcut. Another odd thing. If I click on the share in Places- it opens up in Nautilus, but it also creates ANOTHER entry in Places and on my desktop. So- for every share I mount and access- I get two entries in Places and two desktop shortcuts. I can unmount one of them to get rid of the clutter, but it is just really odd. I also noticed that, in my case the problem is only displaying the shared folder/drives. and add here the response to study. I added the changes suggested by gticlayauri to smb.conf and did a samba restart but it made no difference. In nautilius smb://servername/ shows the available shares. Double click on a share and it is auto mounted following a keyring authentication request. > restart but it made no difference. As requested I have attached my smb.conf file. I'm having the same issue: not able to browse or mount a windows share. My windows share is actually a ubuntu 7.10 setup as a windows share (for other purposes). my gutsy laptop is able to access this share! Please file a new bug describing the issue you're experiencing, and provide the bug number here. This bug report is about a failure to connect to servers that require old password security methods, and has been resolved in hardy-updates; if you're still experiencing problems connecting to samba servers from hardy with all updates installed, that's unrelated to this bug. When access to windows 2003 server with smb://server I can't see shares, but if I try to acces my ubuntu it shows shares example, smb://localhost. When access to windows 2003 server with smb://win2003server I can't see shares, but if I try to acces my ubuntu it shows shares example, smb://localhost. Instead if I try to access some share with smb://win2003server/share it shows folders inside share correctly and I can access without errors. > can access without errors. Sorry, it's true is related to that bug. 3) can see shares, but they will not mount when double clicked upon. What am I to do here guys. So now- I can't access my authenticated network shares at all. Fortunately I'm running intrepid on a secondary machine- I realize it is only in Alpha right now, but I had expected at least SOME progress on this problem. IMHO, this whole smb:// access from nautilus is really not that great. It is fine for copying files but most applications are not compatible with this URL, so you can not drop the files with smb:// access into an application. Another example, if you using Google web mail to compose an e-mail and want to attach a file, you can browse to the smb:// share and click on the file URL but then Firefox does not translate the smb:// URL so it become useless!! I might as well just use smbmount and mount it to a mount point. I really hope to see Nautilus/Ubuntu improve in this area. Could not display "smb://servername/myshare$/" - Einhängen des Ortes nicht möglich. Could not display "smb://servername/myshare$/". Fehler: DBus error org.freedesktop.DBus.Error.InvalidArgs: Mountpoint Already registered - Bitte wählen Sie einen anderen Betrachter und versuchen Sie es erneut. I entered my account data the first time I tried to connect. Strangely enough, in the properties you can see how many files there are on this share and how much data there is all in all, but the file list cannot be displayed. I reported this bug under https://bugs.launchpad.net/ubuntu/+source/samba/+bug/216465. However, going more into it, I think this was the wrong thread to report this to. Is this thread I am writing in now the right one, or should I open a new one? Back in the ubuntu 8.04.1 install, the GUI browsing fails, but smbclient or smbtree can report all the shares. I am using the default encrypted passwords and security = user. The gnome nautilus network file browser (ver 2.22.3) will show the computers with shares on the network, but clicking on a Windows machine icon does NOT show the shares. If I switch the nautilus "Location" dialog to text, and append a valid share name to the computer name, such as smb://laptop/C, then a full successful mount is made and I can see and use the shared files. Once mounted, if I unmount and try again to click on a Windows machine icon it still fails to mount. I applied that patch to gvfs-0.99.8 and it cured all my nautilus smb woes. Why this patch is not yet integrated I do not know. Surely the dozens of nautilus/smb bugs filed on lauchpad must have this common root. No, it is not. This bug is about incompatibility with servers that negotiate weak password encryption for connections, and it has been worked around by a change to the default settings for samba in Ubuntu 8.04. If your problem was fixed by the patch from bug #207072, then your problem is unrelated to this bug report. marking 'wontfix' for gvfs in hardy; the gvfs side of this requires UI changes to detect the incompatibility (and possibly libsmbclient API changes as well), so this is too intrusive for 8.04. Is this a problem with Ubuntu 8.10, too? > Is this a problem with Ubuntu 8.10, too? 8.04 is a lts version. Is the 'won't fix' a long term decision that we hope will be overtaken by upstream developments? "Unable to mount location. Failed to mount Windows share"
Notice the word CLIENT in front of both of those... try to re-mount the smb share again and it all works nicely. I confirm the problem in 8.10 with Windows Server 2003 & Windows Server 2000 authenticated shares. If I open nautilus and type in the location smb://....., works fine. Using Places->Connect to server throws up the error messages "No application is configured ..."
Is there any changes, any care of the developpers ? I don't see any responses. I switched on debian lenny beacause of this bug, this issue never happened. There are numerous responses in this bug from developers. But I think you're following up to the wrong bug; this bug most certainly affects Debian lenny as well. Yes, it most certainly does effect Debian as well. My desktop has this problem (Ubuntu Intrepid) and I cannot connect to my D-Link DNS-323 NAS unless I mount it manually from the command prompt. I did try all of the suggestions here. I can see the server, I can see the share, I get prompted for log in info, and then I see empty folder with the message about not being able to display contents of the share. My Laptop, running Debian Etch worked fine until I did some apt-pinning to pull newer stuff in from Lenny & Sid. I ended up needing to pull Gnome in from Lenny. And now I'm having the same results - cant access the smb share unless mounted via command prompt. could you try if that's still an issue in jaunty? I won't be able to try untill this weekend. I'll swap my 250G HD in my laptop over to teh original 120g one and give it a shot and let you know. As I commented in <https://bugs.launchpad.net/ubuntu/+source/nautilus/+bug/209520/comments/111>, the change needed here is for the gvfs backend to detect when the connection has failed due to mismatched security requirements. Do you know if there has been work upstream to implement this? I would expect such a change to be reflected prominently in the cahngelog. This is a major bug for me, I can't migrate from 7.10 until this issue is fixed. I just checked and Fedora 10 live (gnome) also have this problem. This bug is marked as resolved in Ubuntu 8.04; are you sure this is the bug you're seeing? You don't give any details about the problem you're having. cause an error and I have to revert smb.conf changes. I am sure the same happend with 8.10, when I tried it a week ago and then I found this bug and subscribed to it. oh - sorry, you mentioned upgrading from 7.10 so I assumed you were running 8.04. Yes, for 8.10 and above the default samba client behavior matches upstream's, and doesn't allow insecure security=share connections by default. You can change the behavior on the client side by setting 'client lanman auth = yes' on the client's /etc/samba/smb.conf, as mentioned earlier in the bug report. The only reason this bug is open is for gvfs to provide a better error message when trying to connect to such a server - the client will still refuse to connect to such servers by default, for security reasons. Now if only nautilus (and gvfs) showed clear error message, or even ask to enable client lanman auth. It is now Oct of 09. The 9.10 version is coming out. You understand that the outstanding bug here is about the clarity of the error message only? lanman authentication is still insecure, and won't be re-enabled by default; if your goal is to actually connect to servers requiring lanman authentication, you will have to reconfigure your /etc/samba/smb.conf by hand. It now works, and I do not know how or why. not have a easy way to hook up to other house hold computers. few times, it did work. everything and did not find your article. There are many puzzled noob Ubuntu users with this problem out there. Have mercy, or just give up the idea that Ubuntu is easy to use. configure every machine on the local net? > I just updated Ubuntu 8.04. > With and OK button. > Server not using user level security and no password supplied. If you don't want to deal with command line typing, check out webmin package. > It now works, and I do not know how or why. > not have a easy way to hook up to other house hold computers. > few times, it did work. > everything and did not find your article. > There are many puzzled noob Ubuntu users with this problem out there. > Have mercy, or just give up the idea that Ubuntu is easy to use. > would configure this itself? > configure every machine on the local net? >> I just updated Ubuntu 8.04. >> With and OK button.